For anyone following the discussion regarding the Irish government’s proposal to exclude large trawlers over 12 mts length fishing within 6 nautical miles of the coast, this article for Cork Whale Watch by Skipper Colin Barnes will help clarify the issue. Because of their abundance and commercial importance, herring have been the subject of much study and their ecology is well understood. Their exploitation is controlled with a quota system in place and a Total Allowed Catch is set each season based on scientific assessment of the status of the stocks available. But sprats are afforded no such protection. Because of their small size, they were never exploited commercially at any time in history, (other than a few small scale fisheries), so were never considered important enough to merit scientific study and there is surprisingly little known about their basic biology or ecology. 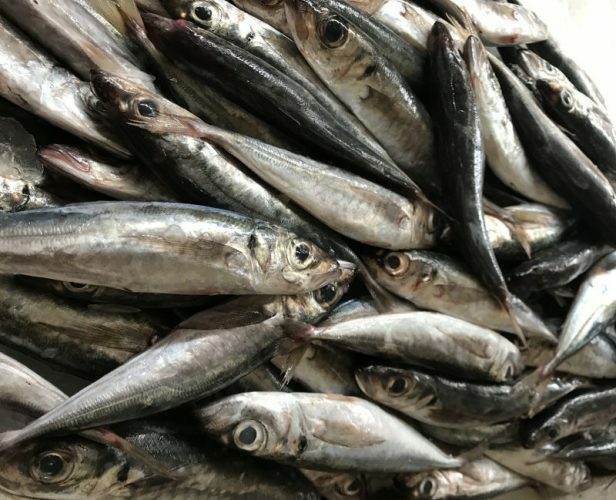 As an abundant and prolific plankton feeding forage fish, inhabiting the upper layer of the seas where plankton is most abundant, sprats are a vital link in the ocean ecology of the north east Atlantic. From the moment they hatch as tiny larva, just 2 or 3 millimetres in length, until they expire naturally 4 to 5 years later measuring around 12 centimetres, they provide a crucial food supply for almost every other fish species in our waters, as well as all oceanic birds, whales and dolphins. In other parts of the Atlantic this role would be filled by the likes of anchovies and sardines; all small, silvery fishes of very similar size, appearance and behaviour. For this reason they are the most important of all the ocean’s fishes, the prey of all predators. Only in the last few decades, a fishery targeting sprats has developed that has brought them from great abundance to near extinction. The biggest of Ireland’s trawlers catch them using a huge mid-water trawl, pulled by two vessels, (usually referred to as pelagic or pair trawlers). Supported with an array of sophisticated fish detecting electronics, it is an extremely effective way of catching fish. Mackerel and herring are harvested by the same vessels using the same technique. Sprats are landed in bulk, for very low prices, and nearly all their landings are processed into fish-meal . Very little of the catch goes for human consumption. This fishery is completely unregulated, and subject to neither restriction nor quota, there is nothing to prevent their being overfished to extinction. A process that is now almost complete in West Cork’s coastal waters. It is the spawning behaviour of sprats that makes them so vulnerable to overfishing, similar to herring. Throughout most of the year they are found at any depth in the water column, spread out over a wide area in local coastal waters, in relatively small shoals, grazing on zoo-plankton, and are too scattered to be economically targeted by large trawlers. But in late September and into October they begin to move inshore and assemble into large aggregations in preparation for spawning. All known spawning areas for sprat are in close to land. With receding hours of daylight and the sea temperature falling, the production of plankton slows right down, and the sprats stop feeding. Plankton feeding forage fish, like sprat, herring and mackerel use the winter months, very efficiently, to carry out their spawning activity, when there is very little food available for them. Their digestive tract shrivels up and production of enzymes cease. This is to maximize the space in the body cavity for the production of roe in females and milt in males. This happens with many other fish species. Again, similar to herring, it is only when they are in this reproductive state that they are of any economic interest to commercial fishers; as they are full of roe and have a longer shelf-life for industrial processing, where they are converted into animal feed. This is the very time when they play their greatest role in the ecology of our coastal waters. The sprat shoals loiter in the general area of their chosen spawning place, whilst their roe and milt develop rapidly, until all is ready for action. The shoals gradually merge together until there is usually just one or two huge gatherings of them in each spawning place. Finally, triggered by the turn of the tide, usually around a full moon in November or December, they pack together until there is hardly any water left between individual sprats. In great excitement, eggs stream continuously out of the females, whilst the males eject their white milt in such quantity that the sea appears milky. This is the only point where they differ from herring in that their eggs are scattered loose in mid water, whilst herring choose to stick theirs to the sea bed. A full moon ensures a big spring tide and plenty of water movement to scatter their eggs far and wide, making them less vulnerable to predation. As with herring, once their spawning is done, the huge shoals disperse quickly and move back out to sea, spent and hungry. They can only targeted by pelagic/pair trawlers when they form into these very large, dense shoals directly prior to spawning. They return to the same locations, year upon year to reproduce, just as herring do, so are easily found and will not leave the area until they have spawned. At spawning time the entire stock of sprat are inshore, in bays, harbours and close to land, in super-dense slow moving shoals, – easy targets for sophisticated trawlers. There are no more sprats offshore or at any other place at this time, even the immature stock, not yet reproductive, assemble with the adult fish. Read the full article at Cork Whale Watch.